The Homecoming Mum has come a LONG way since it’s inception. What began as a simple flower, Homecoming Mums have almost morphed into this elaborate display of personal style. Although a tradition mostly done in Texas, it has bled over to other states and continues to grow through out the nation. Before, the only place to get a Homecoming Mum was at a florist or to make one yourself using items from expensive craft stores. Today, there are companies that actually make nothing BUT mums. Football has always been big in Texas but the Homecoming Mum is now almost as big as the football season itself. Back in the day, mums were actually called “football mums” or “football corsages“. Now they have a category all their own! YES! There is a real flower called a chrysanthemum but they’re no longer used in making Homecoming Mums. 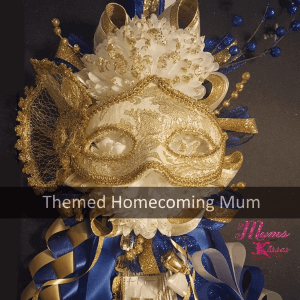 The early Homecoming Mum was only done by florists using the natural mum flower and a few ribbon streamers and were worn as a chest corsage. Like Prom, it was given to a date to wear to a homecoming game or homecoming dance. Before, only girls wore them. Eventually a male version called a Homecoming Garter was developed, again using the real flower and a garter to be worn on the male’s arm. Today a silk flower is used and the homecoming mum is a very customized keepsake. They’ve grown 10x’s in size and are now a representation of both personal style and school spirit. What’s a Normal Homecoming Mum Size? call a “Single Homecoming Mum“. The single is usually the most basic consisting of a single mum flower made of silk measuring between 4 and 7 inches wide. In addition, the customization of the mum is what gets out of control and fun. Whether it be a funny mum, or straight up traditional, it’s all in the eyes of the beholder and the skill of it’s mum maker. College is the same as high school starting over with a single. Other’s say, get the size you like, and the size you can handle. If you’re 4’9 it wil be harder to handle a mega mum that is 4 feet tall for example. Some don’t want to stay in any sort of tradition. Other’s will go with a shape they like instead of a size, for example the heart is a triple mum, and super cute. And if you’re a sophomore and the guy you had a crush on finally asked to homecoming he might get you a triple heart instead of a double, you see? What is customization, isn’t a mum just a mum? Ah Yes! Custom Homecoming Mums are all the rage. Whether the recipient is into Volleyball, Football or Photography the customization are only limited to your imagination and the access of supplies. Trinkets are part of the customization. They are the little “charms” like on a bracelet, that hang from the flower or the ribbon strands itself to make the mum more… you! Expression of color, usually your school’s colors, a show of what activities you participate in at school or out. Again, the possibilities are endless. Why is this important? Still think a mum is a mum? Not anymore. For last decade homecoming mums are now one of the only times a student gets to truly represent themselves at the same time showing school spirit. There’s no dress code to mums, there are few limits, and it only happens once per year! So the mum you choose could be the best or worst decision you make in the school year socially. It’s like picking the wrong color as your date for prom! Are you sure you still want to make your own at home? Professional Mum Makers actually get educated by some of the best crafting minds in the country in order to stay on top of what’s what in the homecoming mum world. Sound strange? If you consider that the homecoming mum industry employees over 2000 workers in the state of Texas back in 2014 alone, and caters to over 4.1 million students, imagine what it is today. It’s an important factor just as any other industry to stay up and in touch with. It’s a professional Mum Makers job to not only make a parents job easier, and take one less thing off their plate of the many man “must haves” of their child but also to keep up with what’s cool, so that you don’t have to. Knowing the difference between a custom maker and a mum decorator. Both are mum professionals with 2 very different distinguishing qualities. 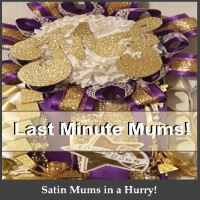 A Custom Mum maker is a professional that makes their mum from scratch using ribbon and materials and has a lot more freedom to create. 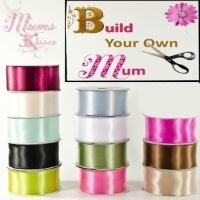 A mum decorator is a professional that uses a manufactured premade mum and decorates it to the customers needs. Both use different materials to create the over all look. A custom mum maker is sometimes called a mum designer as they have a freedom to design whatever your heart desires and their materials are usually more upgraded. They make less mums per season than mum decorators but they make more flamboyant creations. The mum decorator professionals are sometimes called a “cookie cutter” mum maker, as they have a bit of an easier job in some ways. Mums are premade from the manufacturer and only need to use a premade mum color and add the trinkets and personalization’s. Both offer mums, both offer customizations but in different ways. To be fair there are pros and cons of working with professional mum makers and here are a few. Pros: – There are more pros but let’s start with these. This one surprises most parents that have made their own mums in the past. A professional mum maker is almost always CHEAPER than making one yourself. They have access to some awesome material that isn’t easy to get. Like those awesome braids! They keep you from having to spend an hour or two in the store picking out supplies, hoping you bought enough and the right things and not forgotten anything, then going home and spending the next 2-4 hours + assembling it. Talk about an all day job! You’ll be able to fully express your style and individuality on this one designated day per year with a mum professional! Cons: – We’re going to keep it real and tell you the good with the bad. Choosing the right creator is important, you only get this one shot on this one day and if they don’t do quality work, everything is non refundable. Most of the time, mums are a gift, to your child to their date etc if the mum looks bad, so do you as the gift giver. Time lines – Mum makers make a LOT of mums per season. Most successful custom mum makers make upwards of 3000-5000 mums+ per year, and mum decorators make upwards of 17,000-20,000 in one season. if you don’t ask questions ahead of time, you might not get your mum ON time. Make sure your mum maker knows not only when your homecoming is but when YOU need it by. You’ll want time to give the mum, have a mum exchange, size it, hang it up and stare at it etc before the event. Your mum maker can make or break your homecoming if you choose the wrong one. It’s important to check the work, reviews, word of mouth etc before deciding on a professional like anything else. 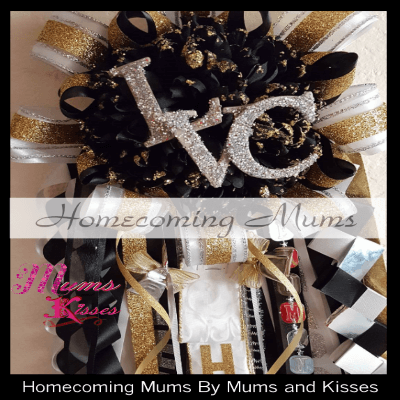 Check Out This Collection of Custom Homecoming Mums. Amazing Designs! How Do I Get A Homecoming Mum? There’s 3 ways to get your very own mum. People choose their own method based on time, cost and design. They Order A Mum from a professional mum maker. Makers such as Mums and Kisses make beautiful designs that can be ordered either by the design or from scratch. They buy one from a craft shop. By far the most expensive method but some like to be able to go to a counter and order and come back later. Craft shops don’t usually use satin or luxury ribbon so in the end the purchaser gets floral acetate (paper) ribbon at a high price. They make their own. If you’re crafty and know where to get the supplies, some may attempt to make their own. Lastly, we have created an Ordering Vs Making Your Own Article that may help you decide what’s best for you. The article breaks down each of the three methods by skill, time and cost to help you make an unbiased decision. Now you are well schooled in the world of homecoming mums! Congrats!